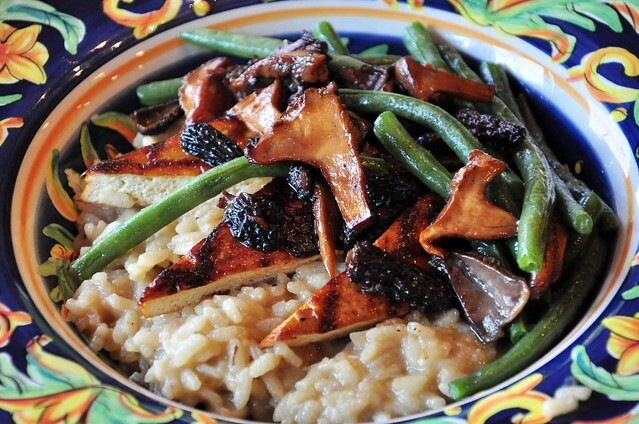 This creamy risotto combines pan-fried chanterelle and morel mushrooms with a shiitake mushroom stock. Also along for the ride was hickory-smoked grilled tofu and green beans. 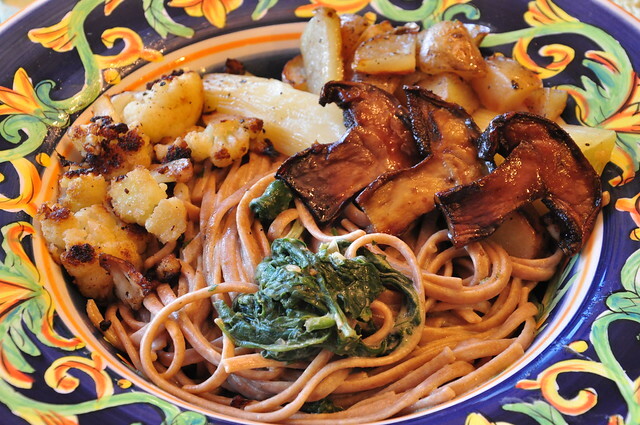 In a large saute pan over med-high heat add the olive oil and Earth Balance. To the pan add the minced shallot, garlic, salt & pepper and cook for 2-3 minutes. Add in the arborio rice and stir to coat until the rice looks chalky, about 2 minutes. Add the white wine and deglaze the pan until the wine evaporates. Then add about 2 1/2 cups of hot shiitake mushroom stock, stir to combine, bring to a boil, reduce the heat to a simmer and cook 7-8 minutes. Next add, the final 2 cups of hot mushroom stock and cook and additional 7-8 minutes until cooked through and creamy (about 14-16 minutes total). While the risotto is going, cook the mushrooms. Clean the mushrooms well (especially the morels). In a medium saute pan over med-high heat add the olive oil until it shimmers, then add the sliced mushrooms and pan-fry until the liquid has released and evaporated, about 6-8 minutes. Add the tamari and stir to coat. At the end of cooking for the risotto, add the Earth Balance and nutritional yeast. Stir to combine, check for seasoning. Top with the pan-fried mushrooms and optional fried tofu and/or green beans. 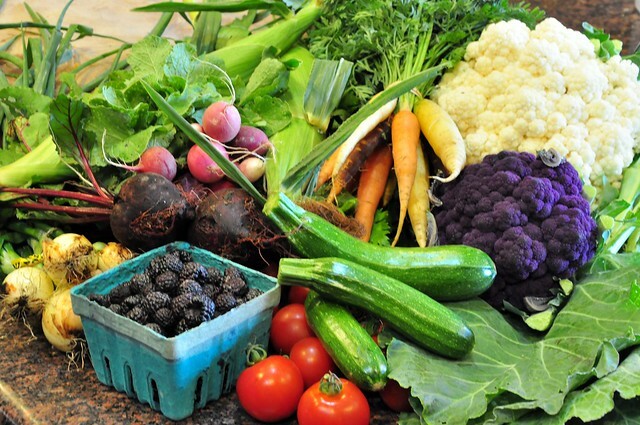 from bottom left: blackberries, tomatoes, zucchini, collard greens, cauliflower (purple, white), carrots, corn, radishes, beets, spring onions, garlic. There are nights like tonight where I'm not motivated to make dinner. Thankfully, I married an awesome woman who knows how to plan ahead! Liz made the Beet Burgers from the Jul/Aug 2012 issue of VegNews yesterday -- as you can see they turned out very nicely indeed. We cooked them in the cast iron pan and topped them with tomato, red onion and avocado. We made a big batch of pressure cooked shiitake broth yesterday, so it was a natural progression to make a nice big bowl of ramen today. 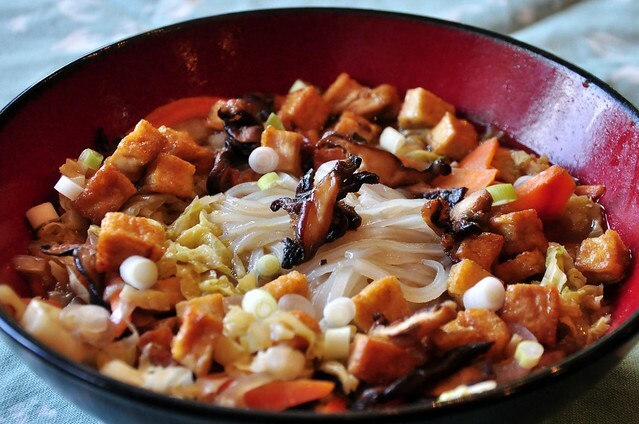 The tofu was smoked with a black tea and then fried in a wok, along with the usual suspects, carrot, red bell pepper, scallions, shiitake mushrooms and napa cabbage on a bed of noodles. 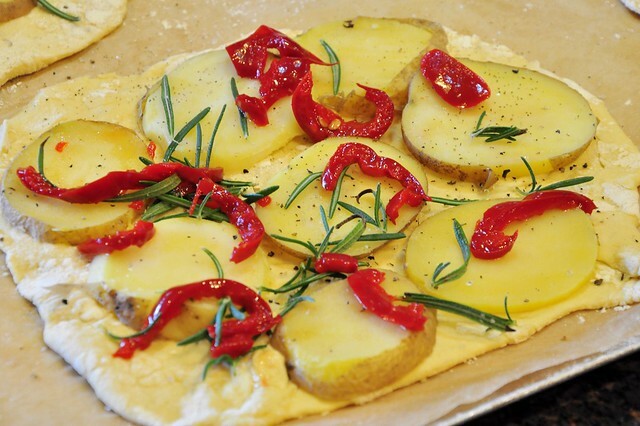 We loved these flatbread pizzas so much we made another batch -- this was one of the new ones, a smoked potato, rosemary and pepper version that despite the lack of Daiya* -- was outstanding. 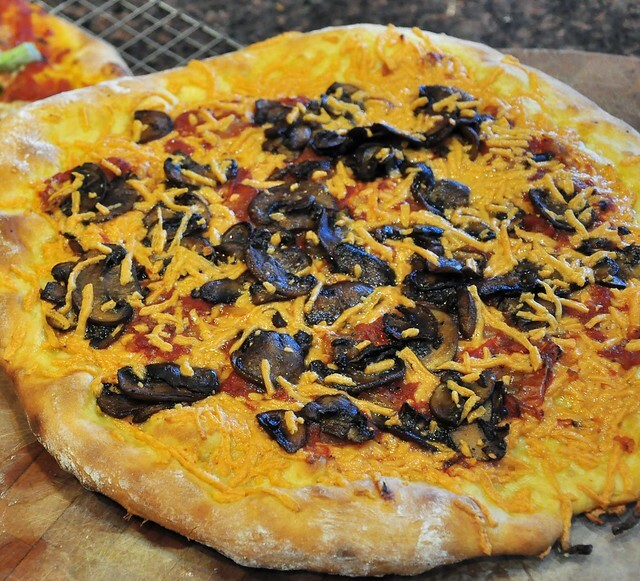 Meanwhile, enjoy Vegan Pizza Day! 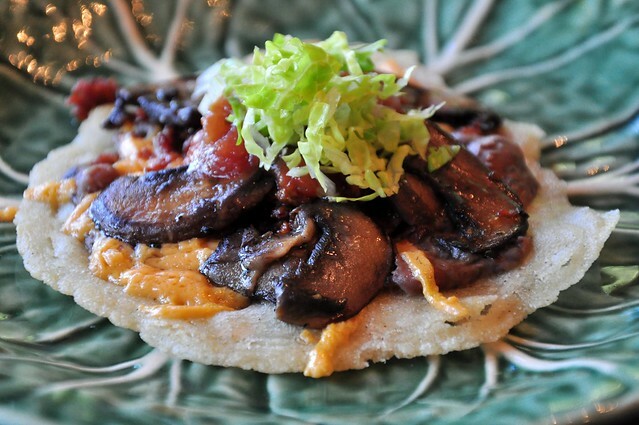 We enjoyed making the corn tortillas last month, so we decided to make another batch and use them for tostadas. 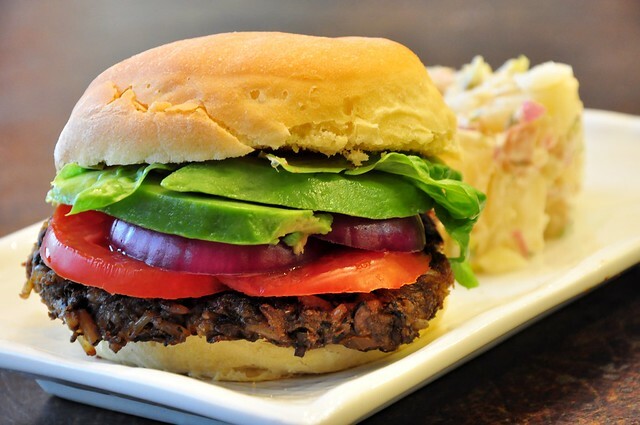 The tortillas were pan-fried in canola oil until crispy and topped with black beans, pinto beans, mushrooms, onions, lettuce and salsa. 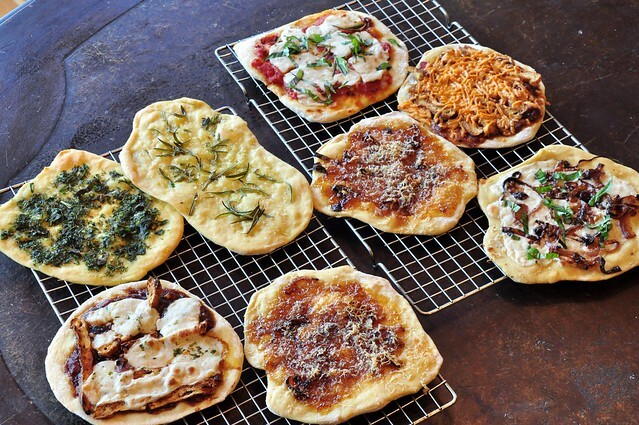 Do you like Pizza? We like Pizza. 1. 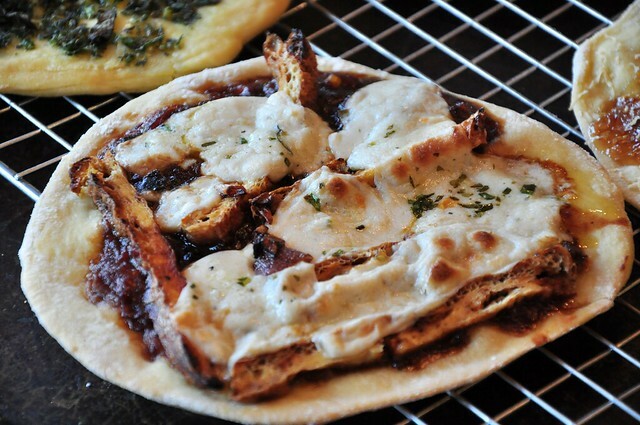 BBQ Tofu and Daiya Jack Flatbread Pizza. 2. 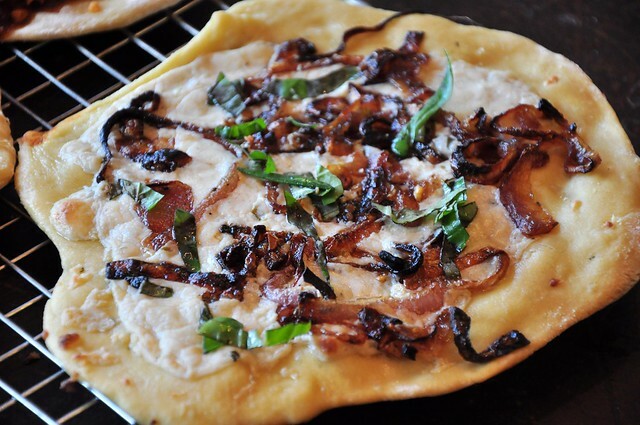 Caramelized Red Onion, Basil and Daiya Havarti Flatbread Pizza. 3. 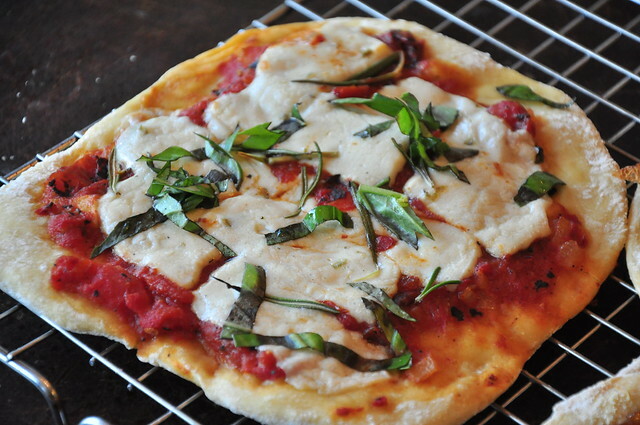 Tomato, Basil and Daiya Havarti Flatbread Pizza. 4. 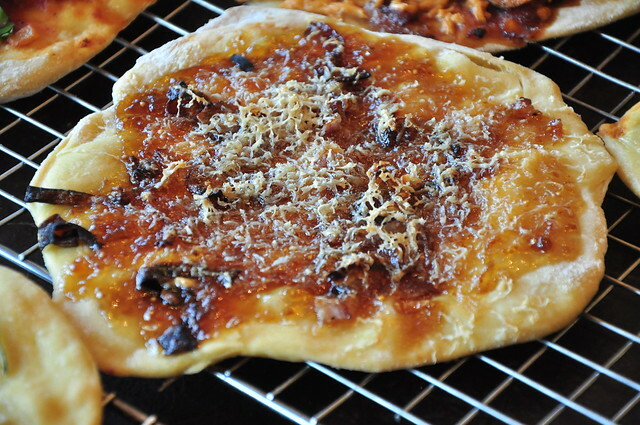 Fig and Blue Sheese Flatbread Pizza. 5. 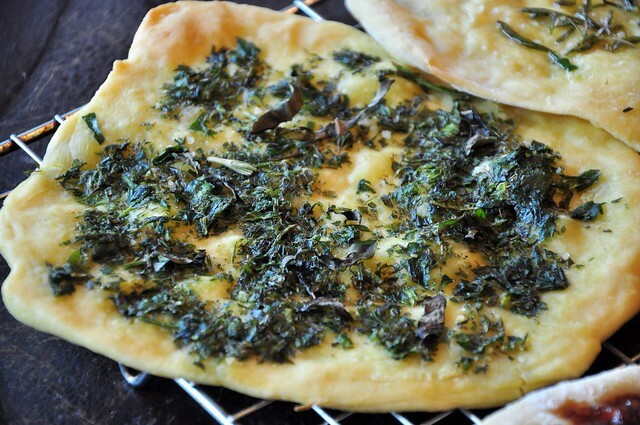 Basil, Parsley and Thyme Flatbread Pizza. 6. 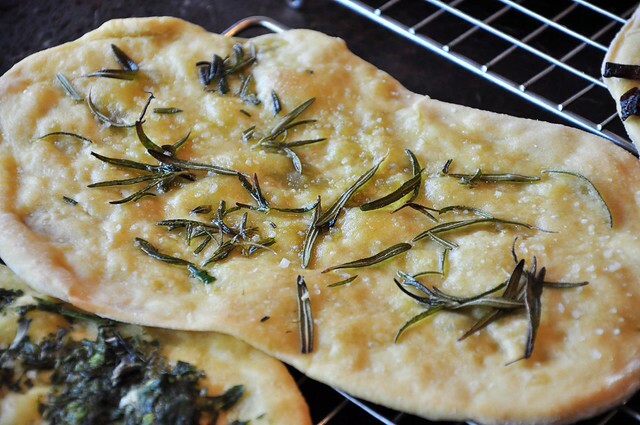 Rosemary and Sea Salt Flatbread Pizza. 7. 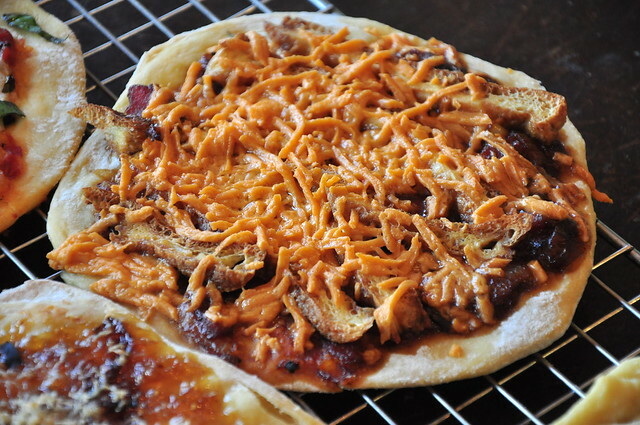 BBQ Tofu, Tomato Sauce and Daiya Cheddar Flatbread Pizza. The mushrooms were marinated in 1 part olive oil, 1 part tamari, 1 part ketchup and black pepper to taste. They were grilled, gill side down to start for 10 minutes turning once. Then they were flipped, and a wok lid placed over the grill to speed the cooking along without losing too much moisture, about another 7-8 minutes, turning once. 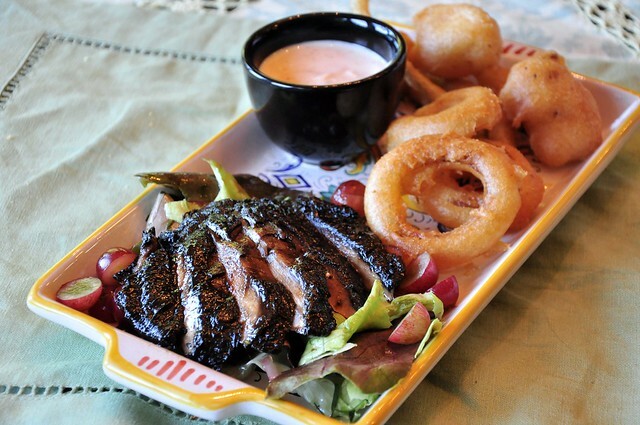 The mushrooms were removed from the grill and dropped in the leftover marinade while we finished up the fritto misto. Then were finally sliced and placed on top of the grape and tarragon salad. For the fritto misto recipe we used cauliflower, onions, scapes and for fun, a couple of olives (which were really good and juicy). This is the first time we've made the fritto misto using the Einkorn flour and the most noticeable difference was that the veggies all stayed much crisper for a longer period of time afterward. We brought back the white BBQ sauce from a few days ago, which complimented the fritto misto quite nicely. We took our usual brown rice burger recipe and finished it off with a couple of slices of the new-ish Daiya Jalapeno Garlic Havarti. We cooked the burgers in a cast-iron pan and put a small lid over the cheese at the end, which, as you can see, melted beautifully. The sweet potatoes were cut into wedges, tossed with olive oil, salt, pepper and smoked paprika and baked at 425°F for 25 minutes. We tried out the Havarti (with jalapeno) style @daiyacheese tonight, along with some basil at the end. Lovely! The chickpea patties are made like polenta. Here's the recipe from "The Truck Food Cookbook" by John T. Edge. We skipped the rest of the recipe and served them on top of a cabbage slaw with an Alabama style white BBQ dipping sauce and a side of grilled zucchini. Sadly, the rest of the recipe is cut off -- but you pour the mixture onto a sheet pan that has been lined with a piece of oiled parchment paper and spread it out about covering the whole sheet. Top the mixture with another piece of oiled parchment, press to smooth it out and refrigerate until cooled completely. 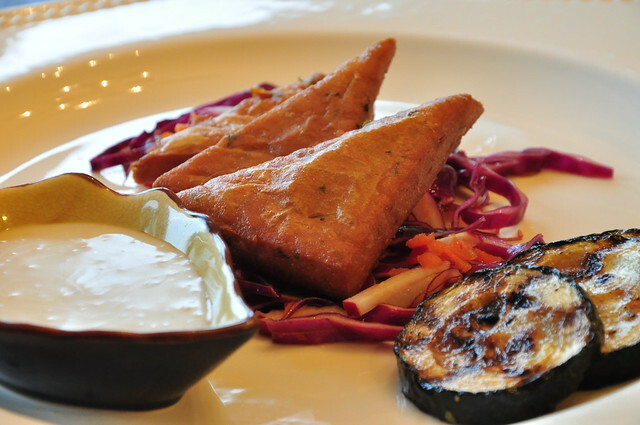 Then we portioned the chickpea mixture into triangles and deep-fried them at 350°F for 3-4 minutes until golden brown. 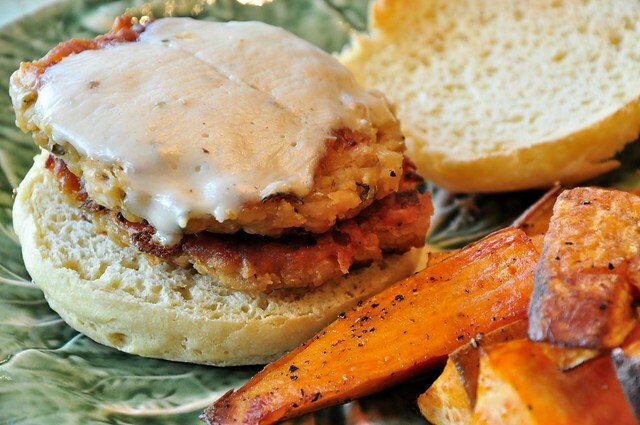 The BBQ sauce was 1 cup of vegenaise, 1/2 tbs. apple cider vinegar, 2 tbs. of agave, 1 tsp. of black pepper, 1 tsp. lemon juice, 1/2 tsp. smoked sea salt, 1/2 tsp. of smoked paprika. 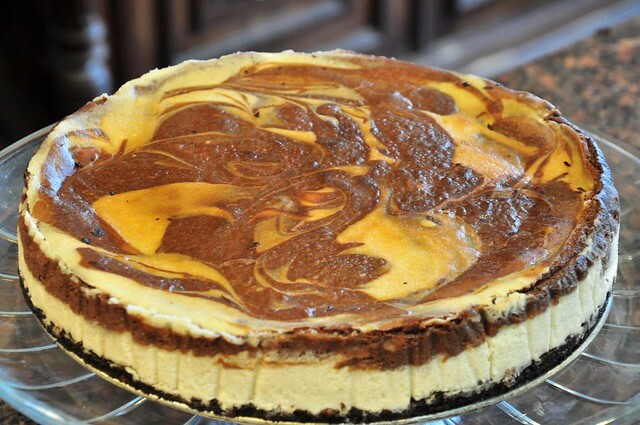 Our son requested a cheesecake (recipe from "Sticky Fingers' Sweets" by Doron Petersan p. 229) upon his graduation from high school and today was that day. 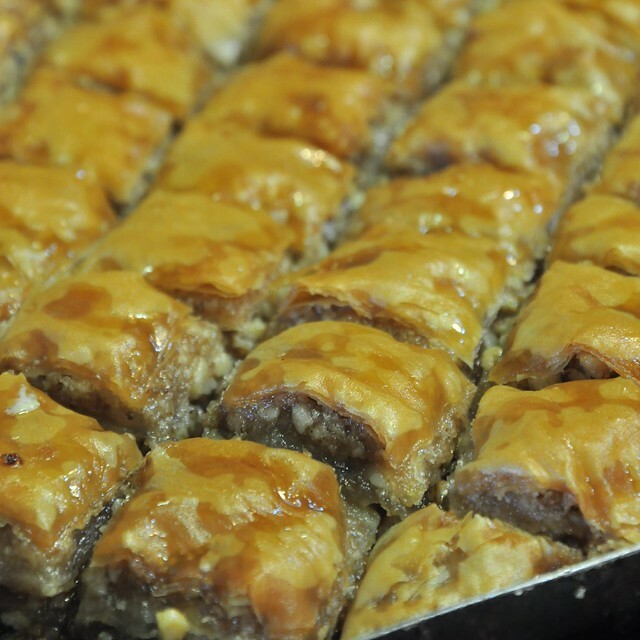 Liz made baklava for a friends graduation party and we got to keep some of the second batch. Apparently it went over well at the party, so that's nice.